The classier vibe at this Chinatown restaurant is in stark contrast to many of the Chinese restaurants in this part of town, where 'no-frills' can be a generous description. Here, expect a classy, modern look with branding everywhere. Dim sum is available at lunchtimes, with dishes ranging from sesame prawn rolls, cheung fun with dried scallops and har gau dumplings to tripe in black pepper sauce, marinated spicy duck tongues and chicken claws in Chinese wine. The evening menu also goes from well-known Chinese crowd-pleasers to dishes many Westerners might balk at. Expect, then, roast duck, kung po chicken and stir-fried beef in oyster sauce alongside fish and tofu soup with preserved egg, and braised sea cucumber with fish lips. Finding a good ‘go-to’ Chinese restaurant is a little difficult in London. There are always differences in freshness, price point, location and comfort. I’ve always gone to Royal China in Canary Wharf, as it's been endorsed by so many 'aunties' but I’m rather glad that I no longer have to make the trek there for my authentic yum cha fix. The above is just a general list of dishes we usually get for yum cha - they’re the staple go to dishes that my Chinese friends and family would usually order. The yum cha here is pretty solid and they have a good range of authentic dishes. The dishes always come out piping hot and the service is quick and efficient. The seating here is also a lot more comfortable than other places and the menu at quite a good price point. I would definitely come back to try for their dinner menu as from the looks of it, looks quite authentic in their offering too. Tip: the best tip for yum cha is to go in a large group so you can get a large variety of dishes and always make a booking as they get very busy on weekends. 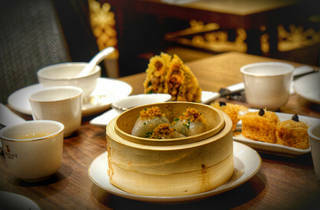 Good For: large groups, yum cha, casual lunch/ dinner, “go-to”/ “no fuss” Chinese food, quick and easy. What a disappointment after reading so many good reviews. I wonder who writes these reviews? This restaurant are too concerned about receiving tips than ensuring the food that they serve is edible. Had inedible chili prawns ( 6 for 13.90!). They were bathed in salt. Swallowed one, sent the rest back. The server apologized but they charged me!! The server did ensure however that I knew that the tip was not included! I freeze when people look at the me, the lone Chinese, to suggest a good Chinese Restaurant in China Town. The turnover of restaurants in China town are mega high but luckily the Orient has been there long enough for decent reviews that thankfully are still true! The service was quick and efficient and I was pleased that no one seemed to chase us out of the restaurant. For a table of 8 (2 cancelled last minute and the restaurant were good to accommodate) we ordered 7 dishes, rice and a whole roast duck including pancakes for starters. Beer, wine sparking water and coke was ordered and it was great to see the bill came to £25 each including a tip we decided, they didn't put on a service charge which was a nice surprise. The food itself was tasty, not too oily but the best call out was I can detect MSG really easily and there didnt seem to be any. Orient, I hope you are here to stay! It's quite a mission to find a good Chinese restaurant in Chinatown. The area is so touristical that most of them don't serve good food. Thanksfully you have some exception - and Orient is one of them! Recommended by Chinese friends, this restaurant proposes an extensive range authentic and delicious chineses dishes. We've never been disappointed by the food. It's always fresh and tasty Their dim sums, crispy duck and other singapore noodles are amazing. The service is a bit cold but very quick and efficient which is perfect for a quick pre-theatre dinner. Definitely a must-try if you're in Chinatown area! Very impressed by this little restaurant in Chinatown, it's got a slightly classier feel than some of the other restaurants in the area and the service matches. However, surprisingly the prices are very reasonable. We plumped for set menu C, while it was the standard fare (i.e. Westeners Chinese favourites), it's exactly what we wanted and we weren't disappointed. It was actually one of the best Chinese meals I've had in a while - food arrived quickly, was fresh and tasty and the portions were very decent. Highly recommended if you're in the area! Looking for decent Asian food in Chinatown is an experience onto itself. Orient London is always a safe backup to depend on, that we have consistently gone back without complaints. 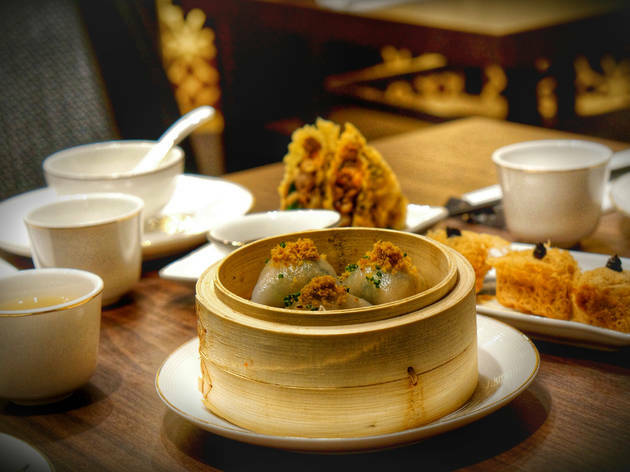 As long as you're not expecting a fine dining experience, the friendly (slightly loose) atmosphere and quick service will serve up a quick dim sum lunch for you.